The Jones Bridge is a bridge that spans the Pasig River and which connects the Manila area of Binondo on Rosario Street. It is a famous bridge that had been reconstructed after the World War II and is one of the busiest bridges in our country. The kid last seen playing with his friends. Unfortunately, it also attracts street children to jump off from the bridge to take a swim in the river below. In a cellphone video that's been circulating in social media, four of five kids could be seen jumping off from Jones Bridge, with the video taker egging on them to go and jump. 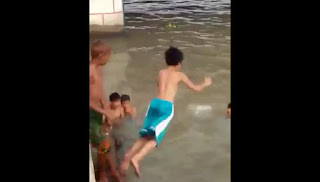 However, one kid wearing blue shorts was hesitant and he refused to jump from the bridge and instead joined his friends on the sides of the river. From there, he decided to jump but did not resurface like his friends did. He was reported missing but was soon found floating along the seawall of MICT compound on South Access Road, Port Area, Manila last Friday, February 19. The 12-year-old Malayao reportedly died from drowning. According to the authorities, three people have died from that part of the river last 2015 but children still repeatedly swim in there despite their warnings. They also warn the parents to keep a close eye to their children so as to prevent the same thing from happening again.